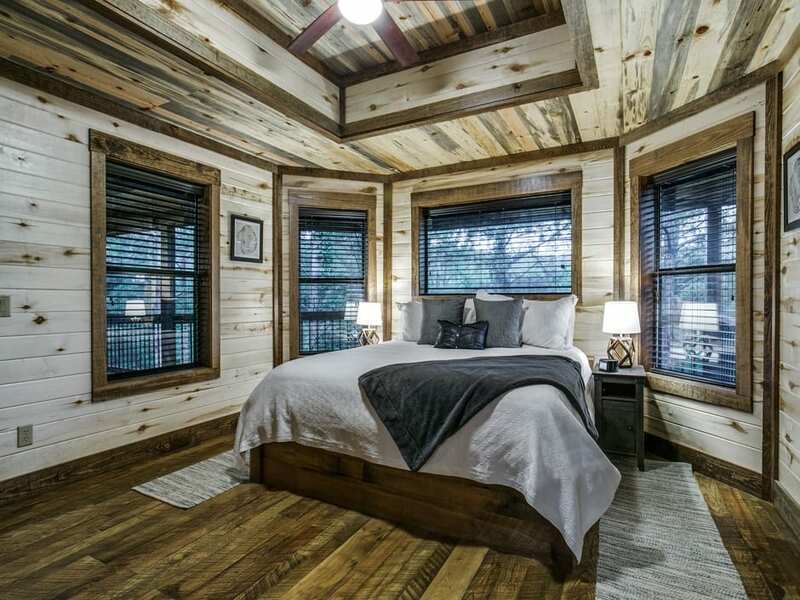 Upstairs bunk bedroom with built in bunk beds – each bunk bed has a lower bed size of full and each bunk on top has a twin size bed Each bunk offers USB outlets, personal lights, & windows. 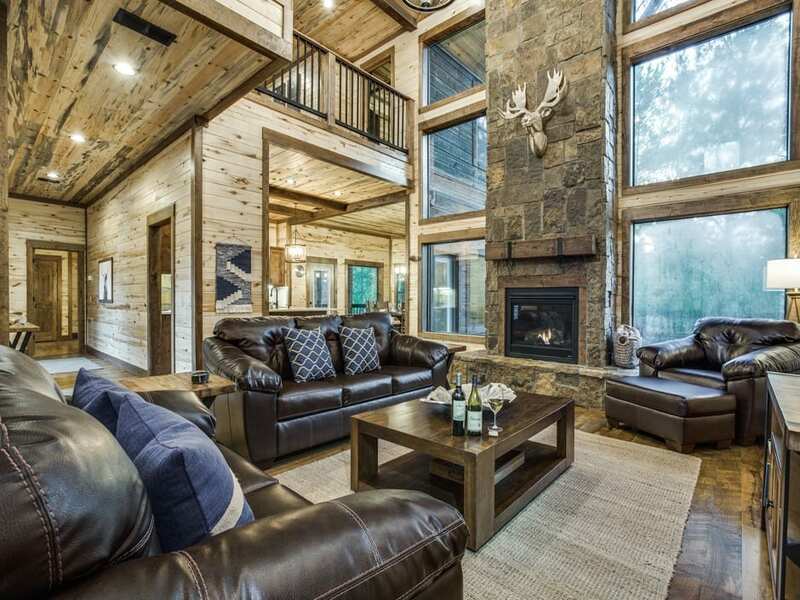 Rustic Mountain Lodge is a 3,900 sq. 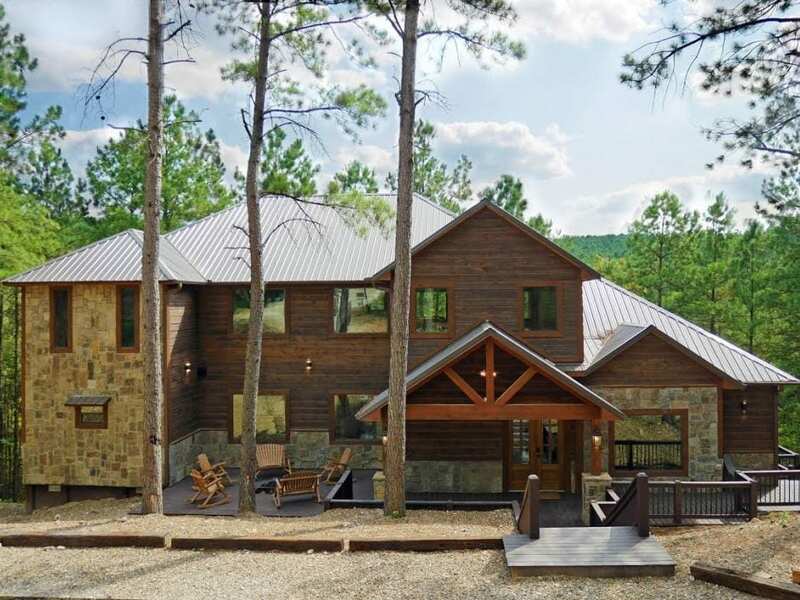 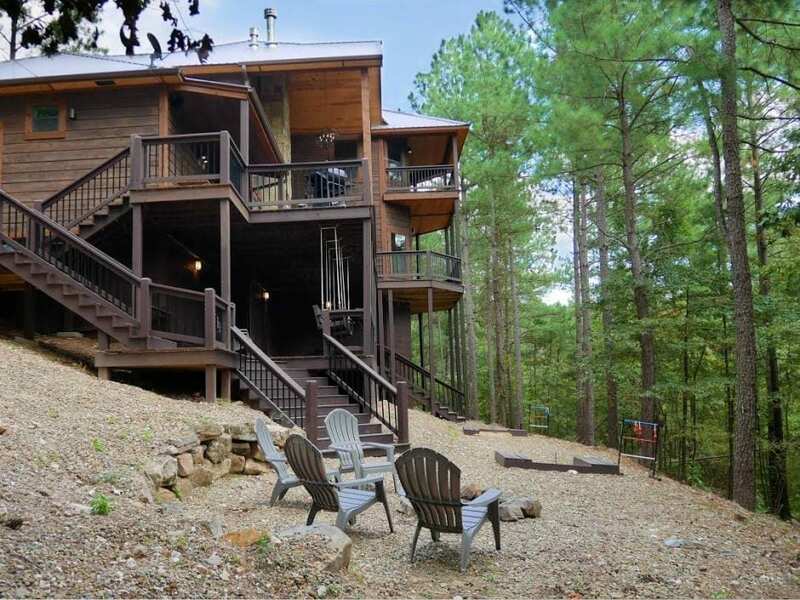 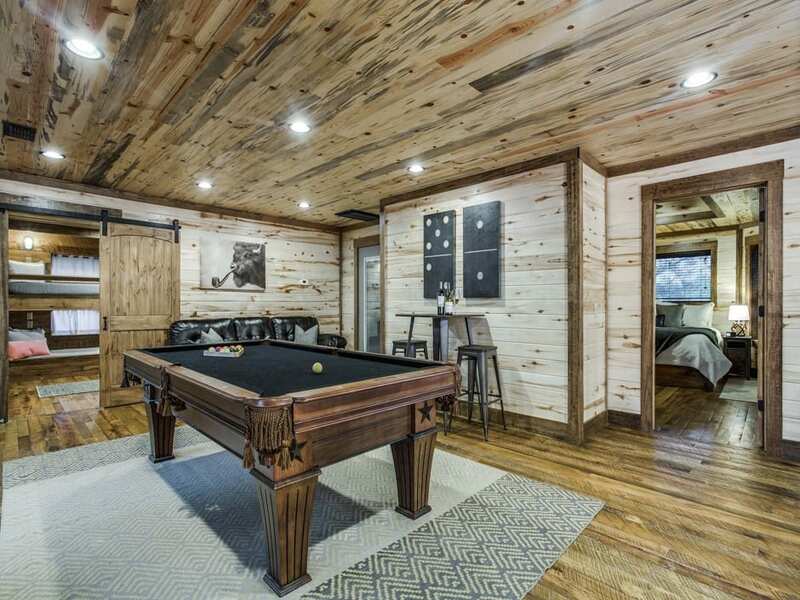 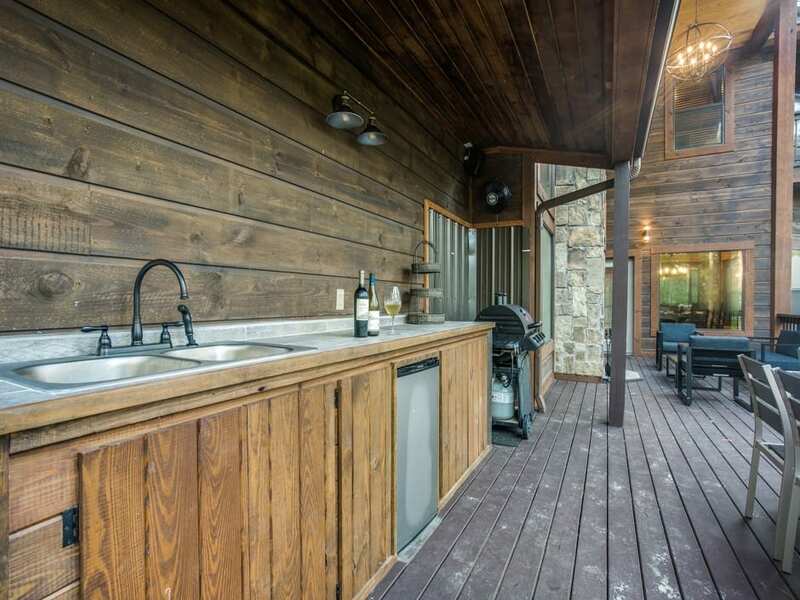 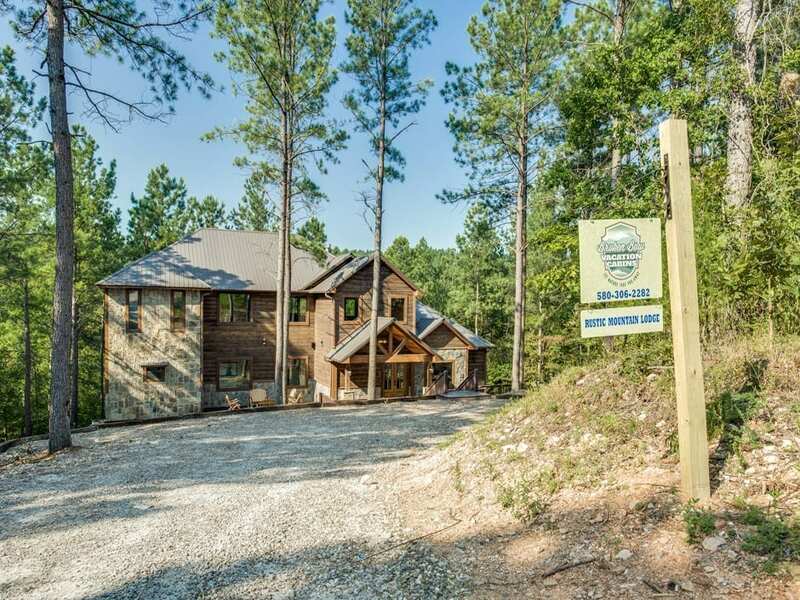 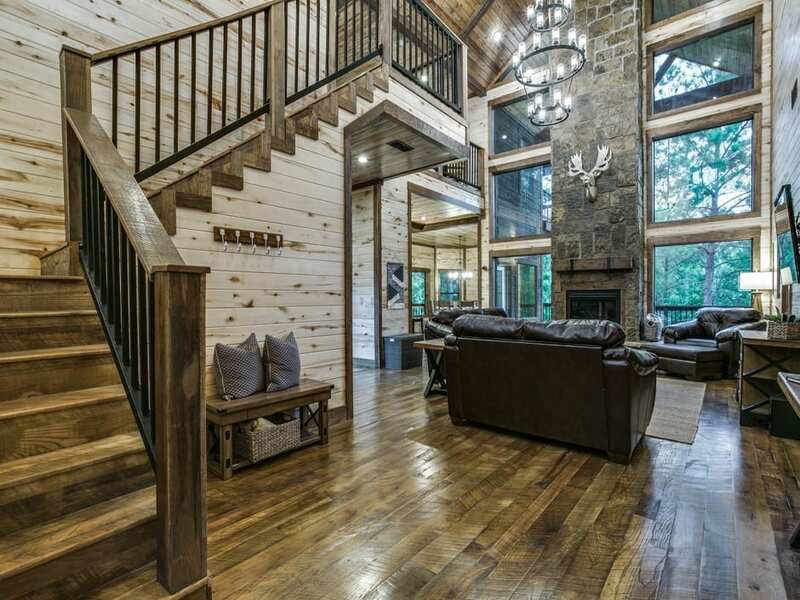 ft. custom luxury cabin with over 2,700 square feet of deck spanning three levels. 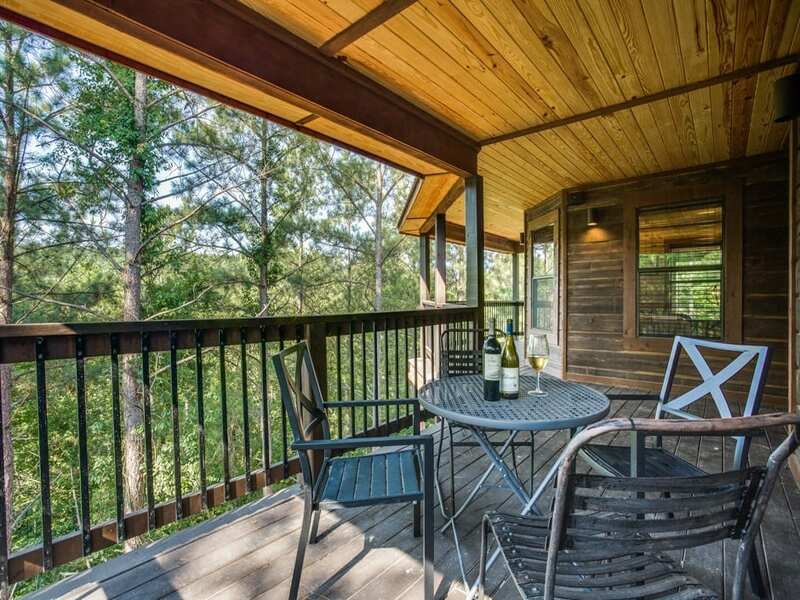 The cabin is set on the side of a mountain among majestic pines and hardwoods and a serene seasonal creek. 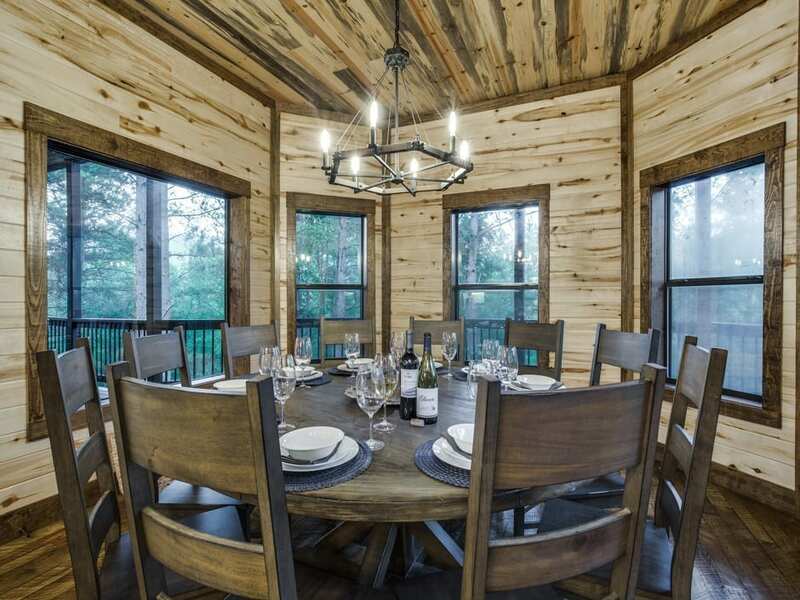 Its rich and spacious interior boasts a grand living area with custom wood floors made from seven types of wood. 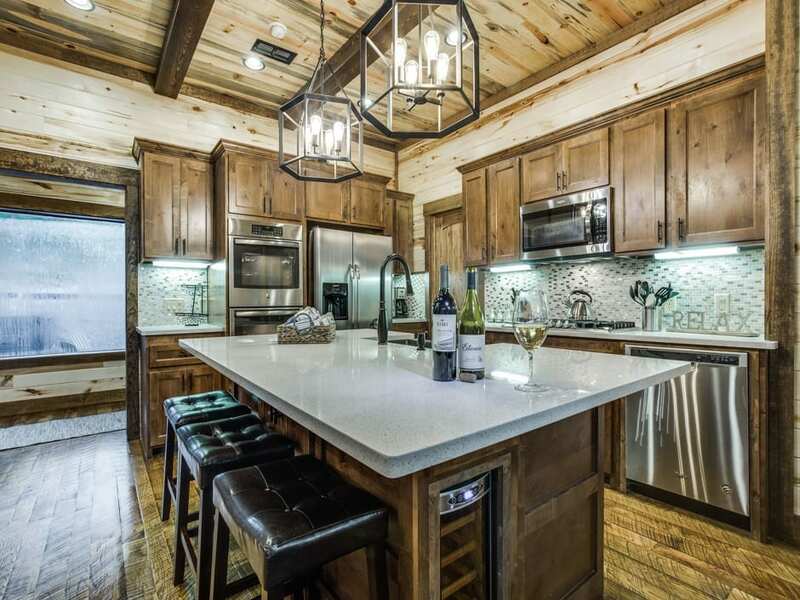 The open kitchen is equipped with quartz countertops, a wine refrigerator, an oversized gas cooktop and a large kitchen island. 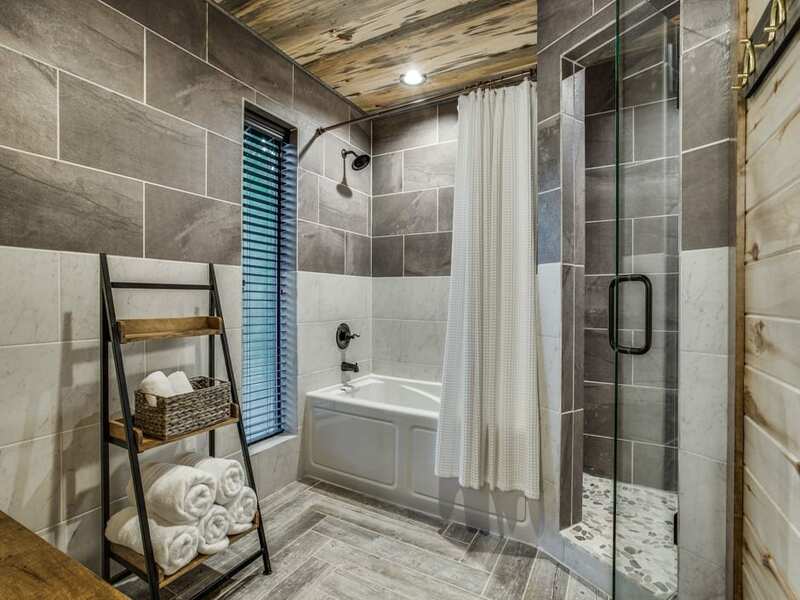 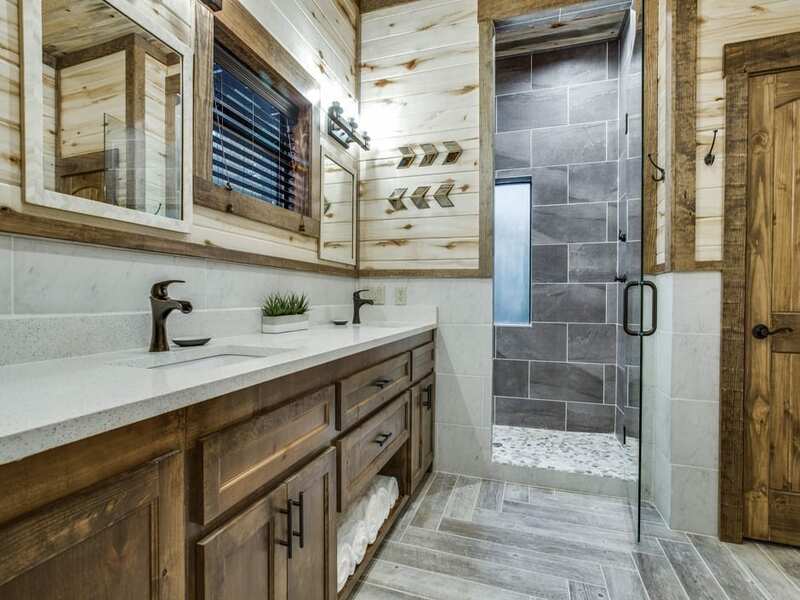 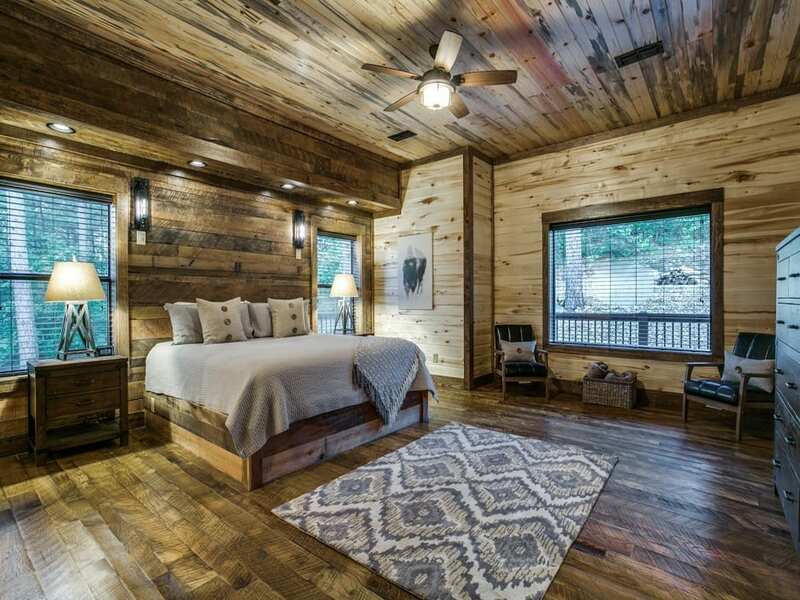 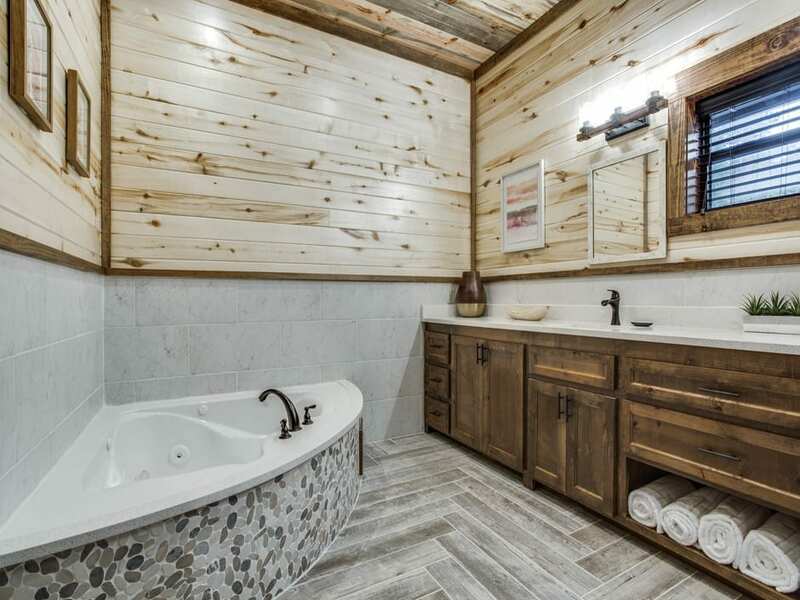 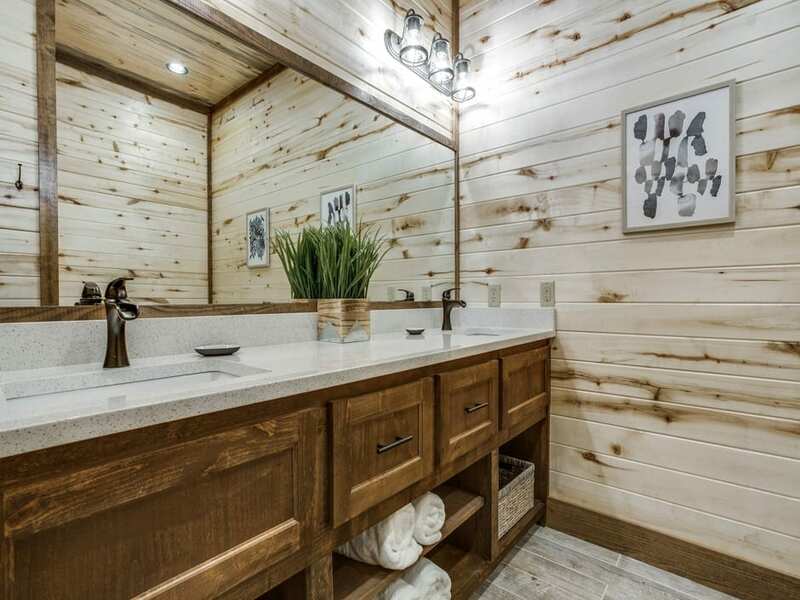 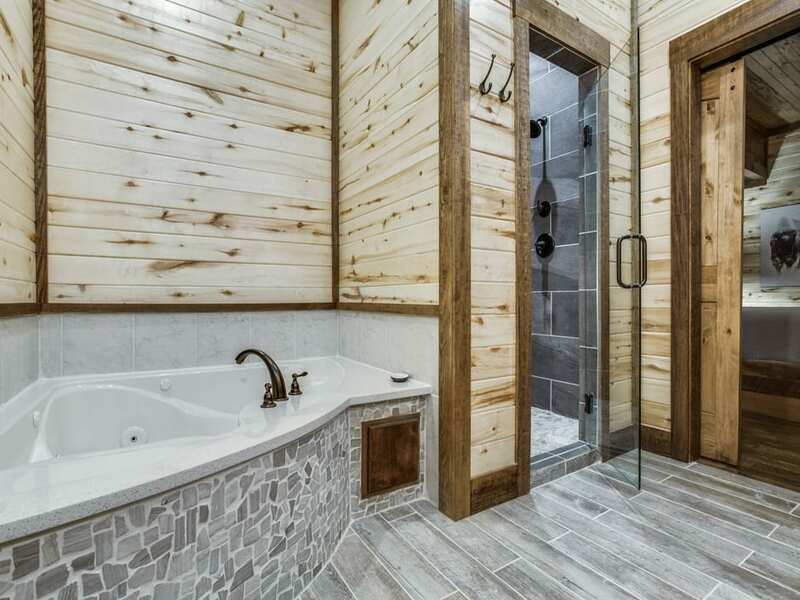 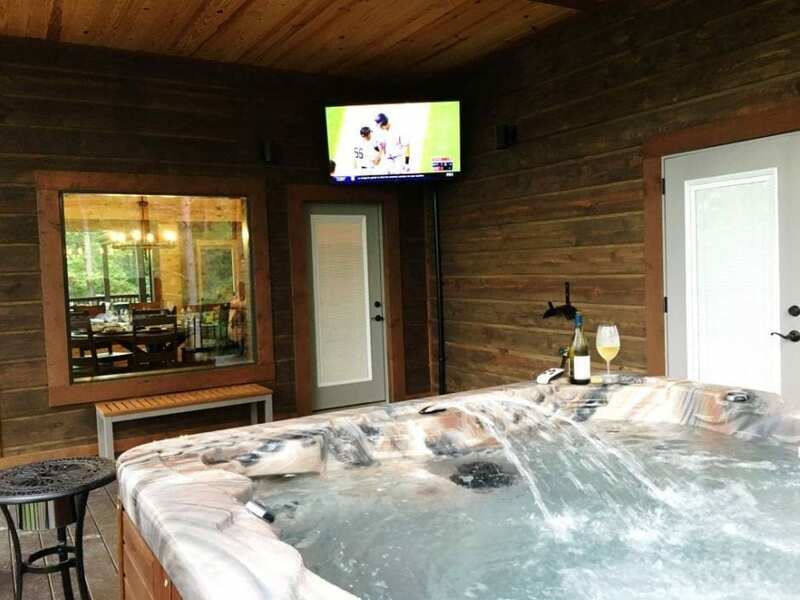 The cabin sleeps up to fourteen people with two master suites that include plush, luxurious pillow top king beds with bathrooms offering tiled walk in rain showers and corner Jacuzzi tubs. 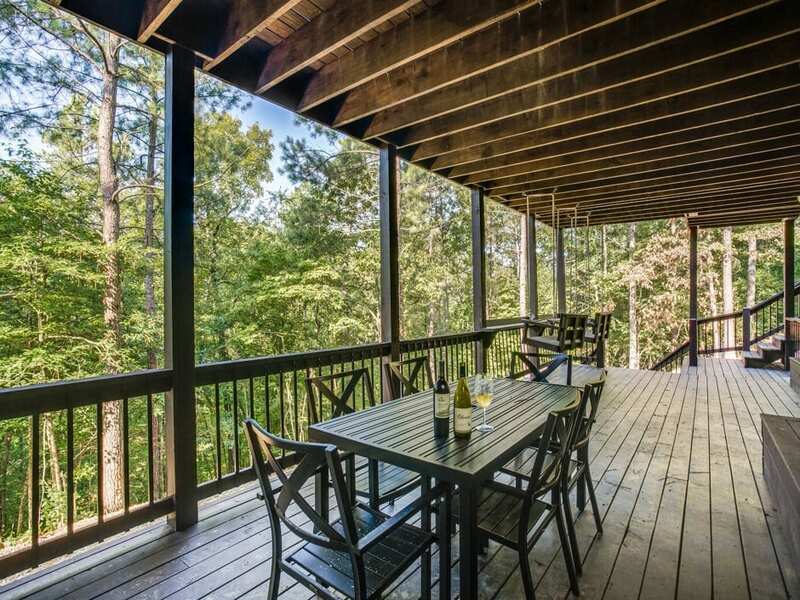 The upstairs king bedroom offers a 180° view of the treetops. 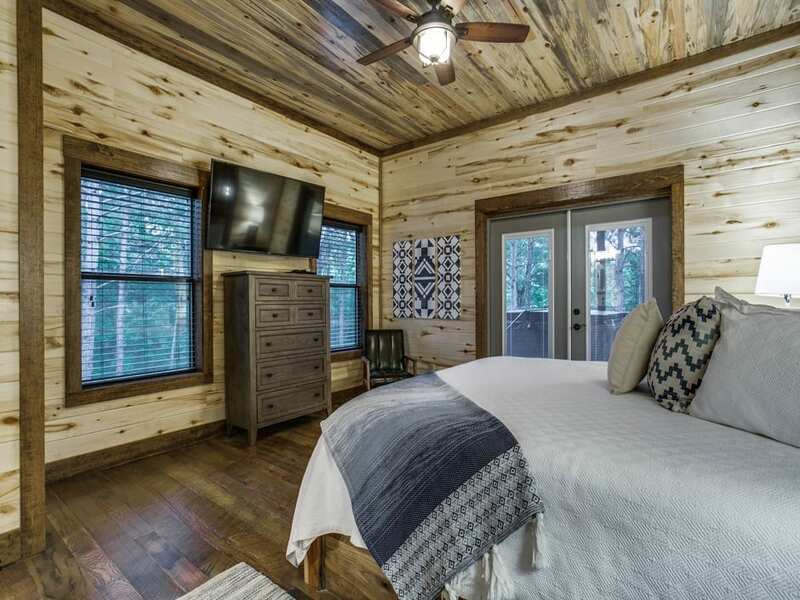 The bunk room is great for kids and adults alike sleeping four adults comfortably with two twin beds on top and two full beds below. 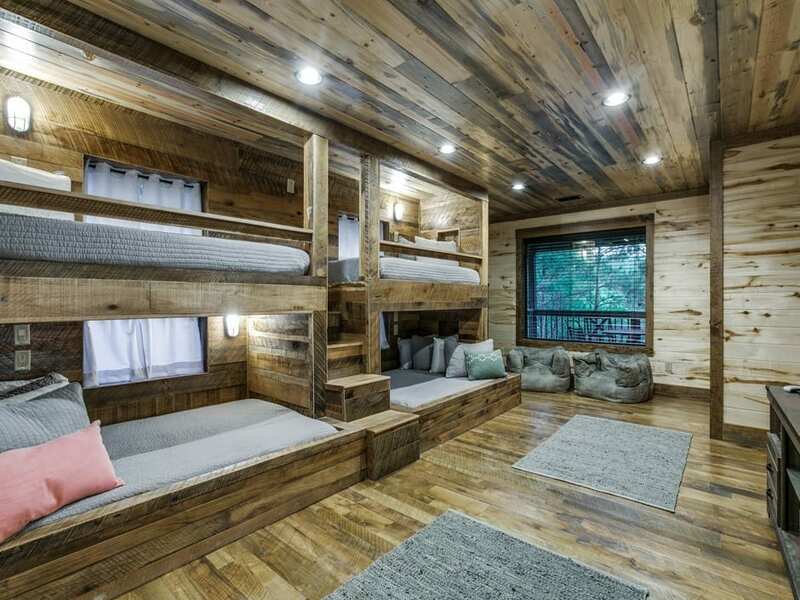 Each bunk has its own USB outlet and personal lighting. 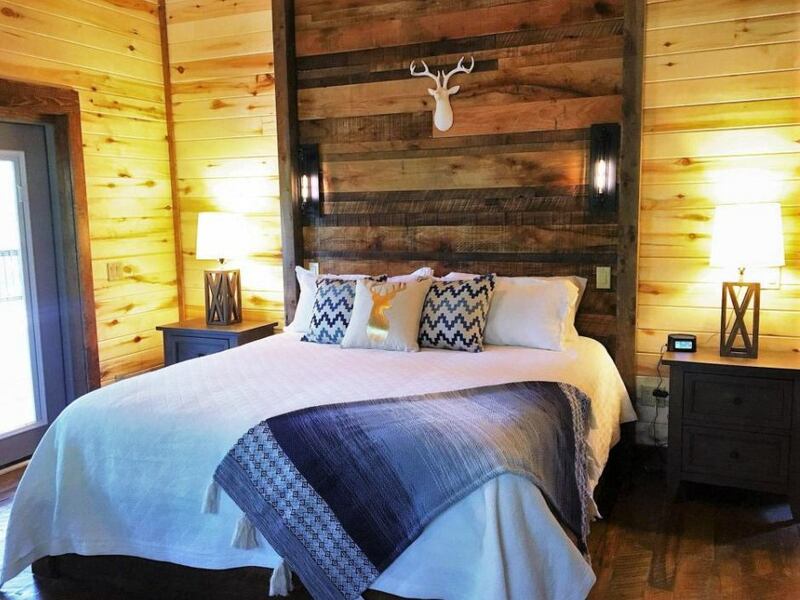 Rustic Mountain Lodge offers two pull-out queen beds– one downstairs and one upstairs. 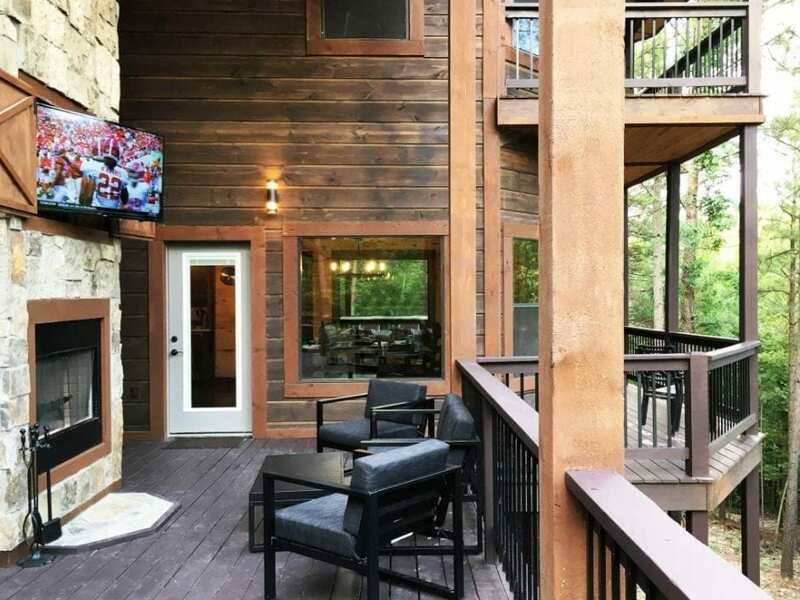 Each bedroom offers a 55” UHD smart TV and Blu-ray player. 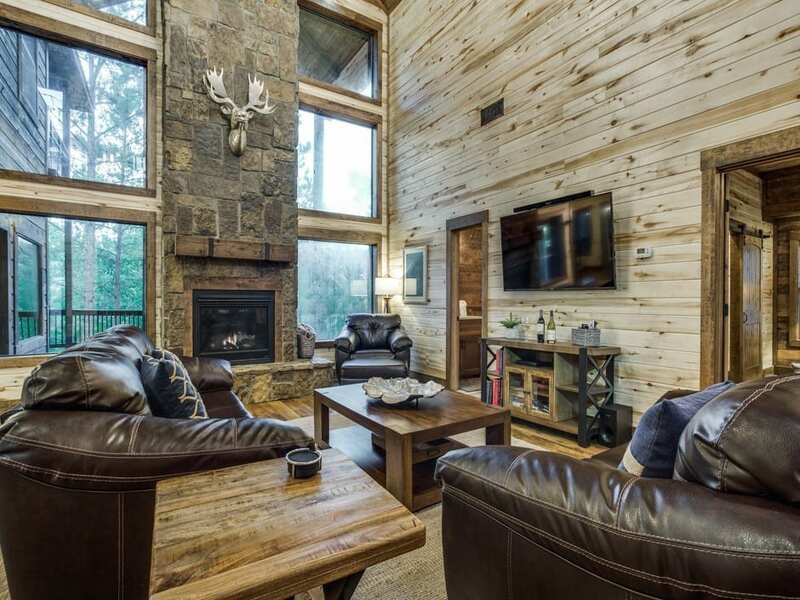 Both the living room and loft spaces offer 60” UHD smart TVs, Blu-ray players, and sound bar with subwoofers. 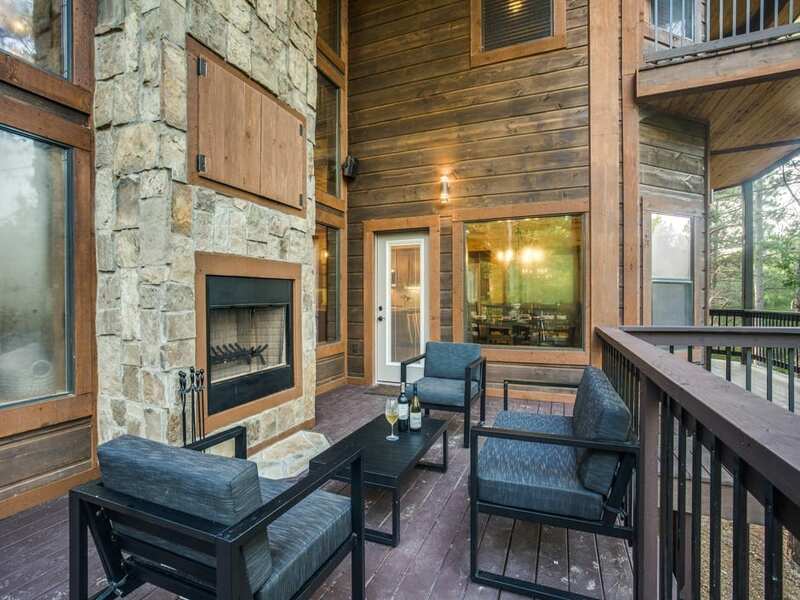 The expansive outdoor living space includes three deck levels in the back and one deck in front for gathering and/or entertaining. 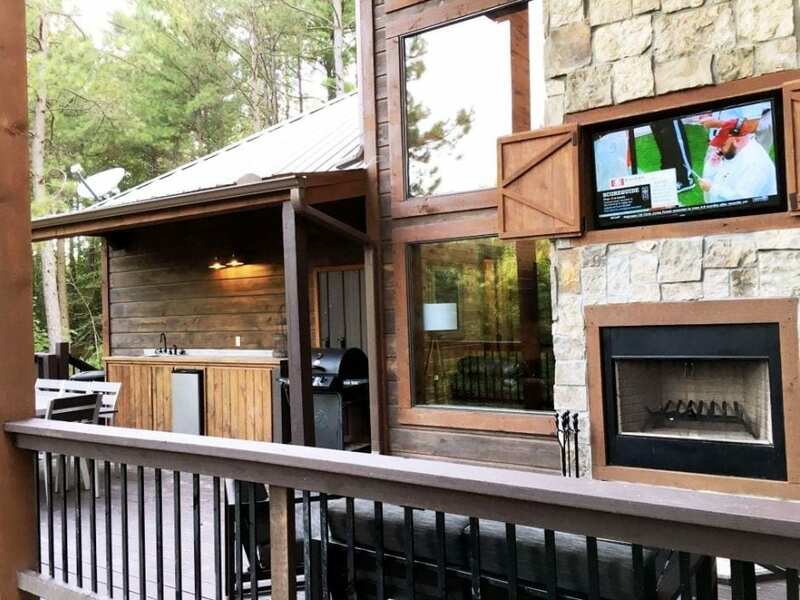 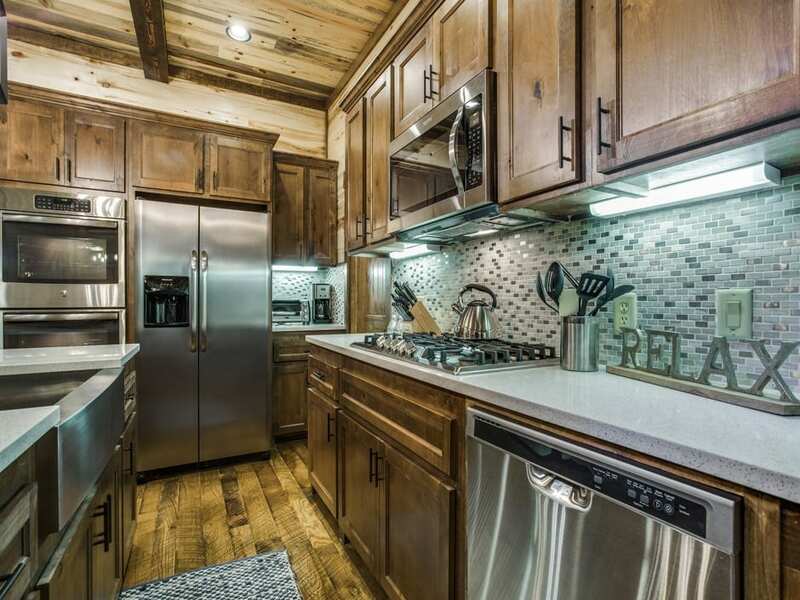 With a view of the towering pines and beautiful nature, the main deck is equipped with an outdoor kitchen that includes a refrigerator, double sink, propane grill, and buffet. 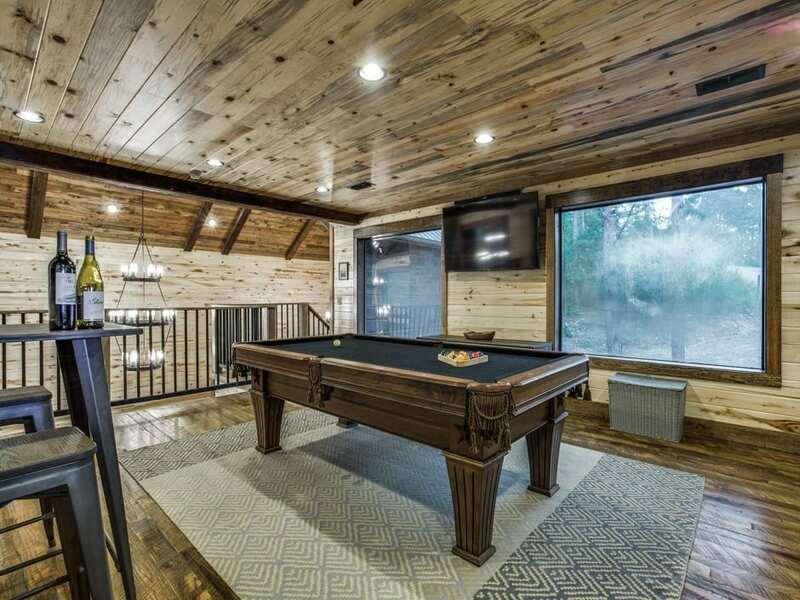 This level also includes a wood burning fireplace, a six person hot tub, two 55” Samsung smart TVs, speaker systems, and plenty of seating. 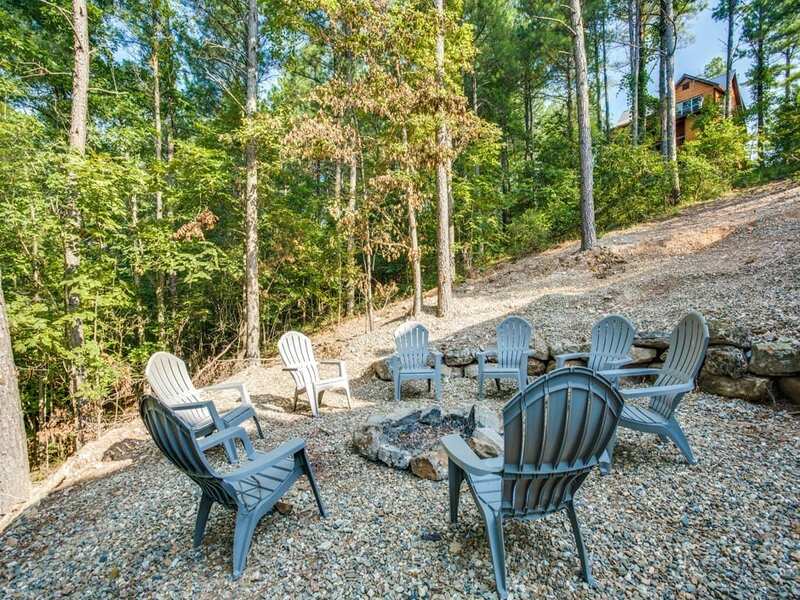 Every hour can be happy hour on the lowest back deck with two bench swings and a bar with a view of the horseshoe pit, the lush woods, and the fire pit. 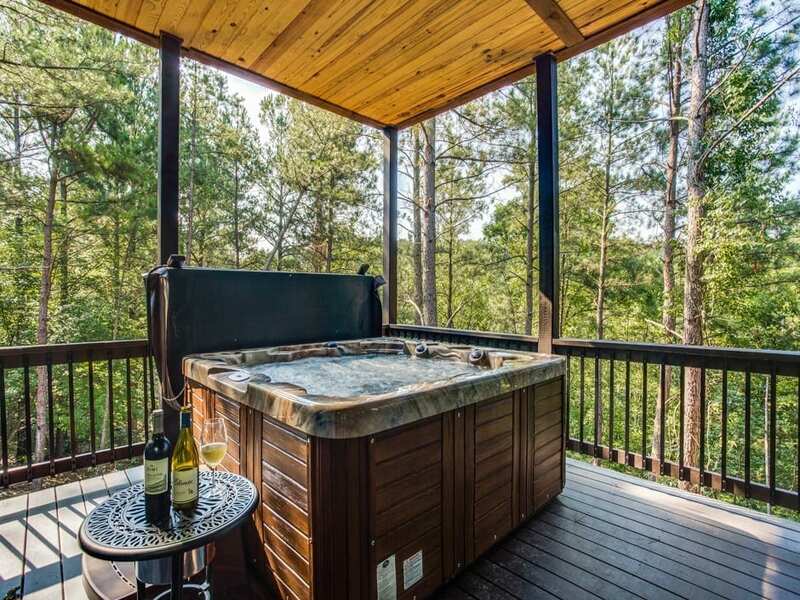 Take in the vast and incredible sights of the rolling terrain, treetops and radiant sunset from the 30 foot high top deck. 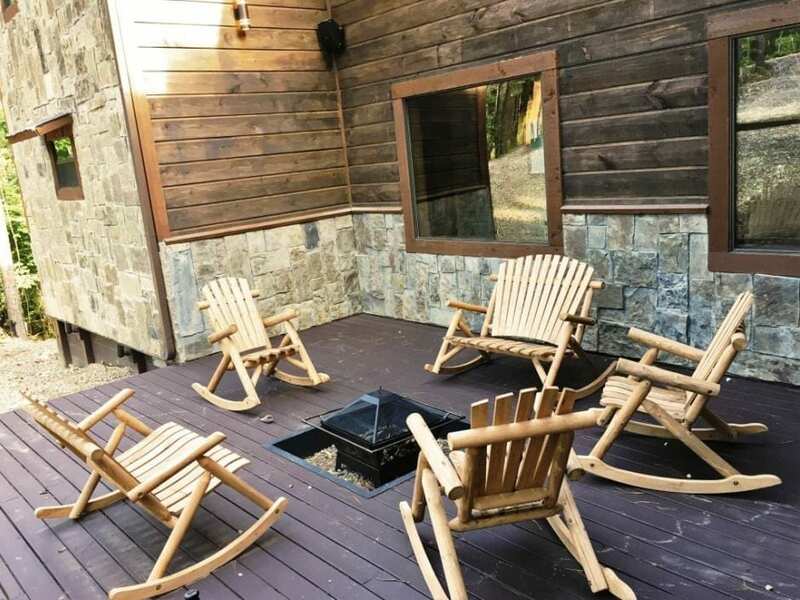 Enjoy an evening under the stars while gathered around one of two cozy fire pits with abundant comfortable seating.